Welcome, I am so glad you stopped by! My guess is you are searching the web because you are bored, in need of something specific or you heard I carry magic lipstick! WHAT? You don’t know about Magic Lipstick? Girlfriend…seriously? Let’s chat later… cause ummmm you are gonna need some of that. wink wink No matter what your reason for being here, I am glad you stopped by. Maybe I should introduce myself and let you get to know me…I joined SeneGence for the discount plain and simple, but ended up falling in love with the results. WAIT! Let’s back up and start at the beginning. Los Angeles traffic is crazy where I live. My name is Stacie Contreras and I live in Southern California. You know, the biggest parking lot of all time! Our freeways tend to be more like parking lots, giving drivers lots of time to people watch to say the least or even perform karaoke while driving ( no not me as I have the voice of a dieing cat)! 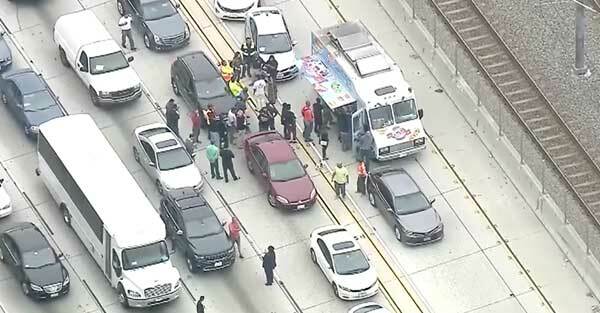 Recently it was so bad news cameras actually showed people grabbing food from a Food Truck right on the stopped freeway. No, I am not kidding! Fast forward a bit shall we? Squirrel moment here! I am happily married to my husband, Brandon of nearly 21 years, although we have been together for what sometimes seems like a lifetime. We have 3 kids, ages 18, 19 and wait for it…. 27. Wow… I am old! I swear they were just toddlers running around naked wearing only rain boots and streaking through the neighborhood chasing eachother and their beloved pets. Speaking of pets, we are that crazy rescue everything family. head shakes Although we no longer have rescued lizards we do have 4 rescued dogs and 1 cat. Personally our Siamese, Zeus is more of a Diva than a cat. I swear he is the biggest Diva ever and yes he does run the household. Sorry, again Squirrel moment … I tend to have them a lot! 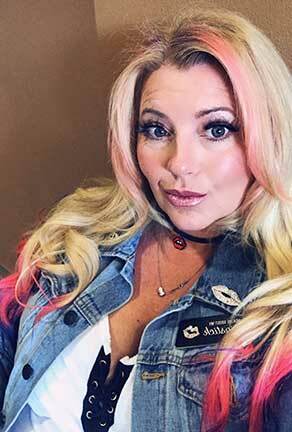 I was a hardworking, tied to my job, mom of 3, working in the dental field for almost 25 years before I walked away and went on to earn my paycheck playing makeup. Was it as simple as that sounds? Yes and no, but thats a story I will probably share soon in my blog, so be sure to check it out. I joined SeneGence in 2014 to get a discount after falling in love with the products. My pitties are never far from me. I ended up selling our Magic Lipstick when my then 14 year old daughter asked me to do it with her. Say what? My teen wants to spend time with me? For those of you with teenagers you know that is a miracle in its self, so you jump at the chance. Am I right? We had fun making money together and I soon realized that I truly loved helping others find answers to their problems. Whether it was helping people solve their skin issues, find some missing self confidence or even find a way to make more money, my passions in life changed. And through my desire to help others I ended up following a path I would never have imagined. I began learning how to apply makeup. That alone is pretty funny, since I was that girl who almost NEVER wore it before. Oh yes, mascara and good lipstick … those were my jam! To spice it up maybe some blue eyeshadow… eye roll … but anything else was pretty foreign to me . After all makeup was pointless and annoying since everything would simply sweat off or smear. Ain’t nobody has time for applying makeup only to have raccoon eyes within hours and foundation sliding down their face in the hot summer heat. Not to mention the fact that my face was like an old leather shoe or dried up apple head and face makeup just made it look and feel worse. It was heavy and cakey. I am sure you know the feeling right? Squirrel again … eye rolls So, I started learning how to apply makeup better. I began training and practicing my skills. I worked hard at my development and I am now proud to say that I was blessed to become one of the few MUA’s with our company who were consistantly requested to do the makeup for our companies photo shoots. Not only that, but I am now one of the founding Elite MUA’s as well. My work has since been in our online presence, our cataloges, media submissions and now the Jumbotron in Time Square. Crazy how life takes you on a roller coaster ride sometimes isn’t it? I am blessed to play makeup for a living now and I love it. I love helping men and women find answers to issues they are having with the help of products that really work. GUARANTEED! To show those who are searching for another source of income an option that anybody can do with persistant work. And to simply be living a life that I truly love and am able to enjoy my family and those that I care about. 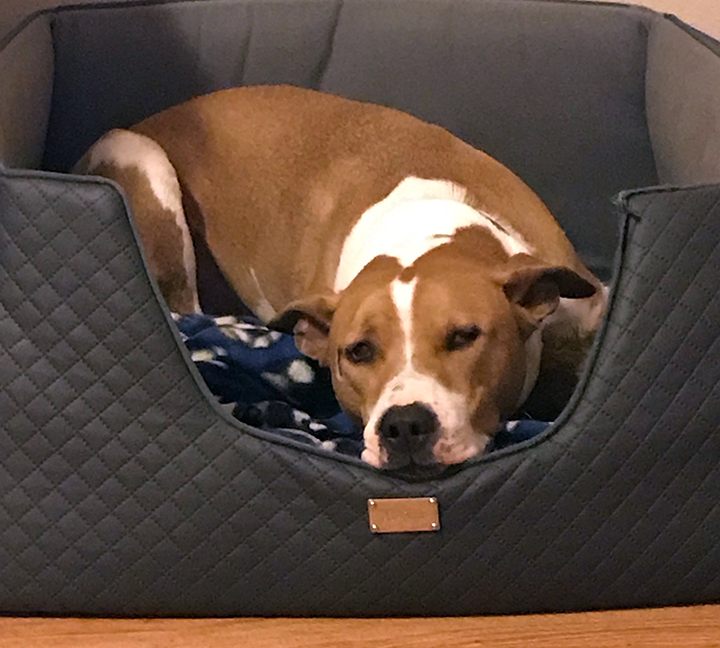 Giving back to the community, helping the homeless and fulfilling my passion to help abandoned pets, especially Pitties. Well did you get through it all without falling asleep? After all, makeup is personal and how can you feel comfortable with me, if you don’t know anything about me? Have I answered your questions? Let me know if there’s something I missed and I’ll be happy to help! Need personal attention? Suggestions on colors? No idea about skin tone? Shoot me an email ( stacie@lipcandie.com) and I will be sure to help. Or visit my FAQ where you may find just the answer you were looking for.